What was your journey into the martial arts like? I started around the age of 9 or 10 in a karate program at the YMCA in the small-town of Shawnee Oklahoma for a month and then later joined a taekwondo and Hapkido School and eventually received my black belt in both arts in 1989. In the 90s I took a break from martial arts to pursue my musical career and at that point started playing in local bands and eventually moved to Oklahoma City to play drums for one of the more popular local bands at the time. Around 1997 is when I met the band Tool and their singer Maynard James Keenan. I also was fortunate enough to meet Maynard’s bodyguard at the time who ended up being Henry Akins. Henry at the time was a blue belt under Rickson Gracie (now the third American black belt) and was getting dropped off of the tour in Oklahoma where his family lives. We exchanged numbers and he came over the next day to my house where we ended up training on the carpet. I will never forget how magical those moments were and how blown away I was by the techniques. Me and Henry became immediate best friends and remain friends until this very day. Because there were no Jiujitsu schools around me or even in Texas at that point I started training at a reputable judo school called USA stars. USA stars was not just a judo school, it had all sorts of wonderful martial artists, teaching everything from Thai boxing, filipino arts, Japanese Jujitsu, combat jujitsu, judo and MMA. Around 2002 I received my black belt in Combat jujitsu. In 2002 I also started training with Brazilian jiu-jitsu black belt Leonardo Xavier and by 2007 was a brown belt in Brazilian jiu-jitsu. Although I loved the sport aspect of Brazilian jiujitsu it was much different than the Jiujitsu I was first shown by Henry Akins. As a brown belt I left my association a little bit disillusioned and in search of the original art I had fell in love with in the late 90s. 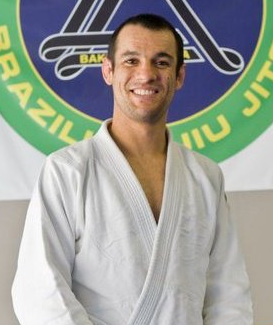 In 2009 Rener Gracie came to my school and did a seminar. I knew at that point I had found what I had been looking for. I have been following him and his brother Ryron ever since. I received my Gracie jiujitsu black belt from the Gracie Academy in 2013 and it is one of the greatest accomplishments of my life. How do musicians balance all that they have to do with their training? It’s hard but you find time for the things that you love. There is now even a Facebook group for touring musicians that allow us to find the schools that are most receptive to our training schedules. There is also another click that me and my rock ‘n’ roll friends who train have created which is called Rockjitsu! It might seem like a crazy idea to most people in the music industry but I always have a knack for making crazy ideas work – so I’m cool with it. You and Jennifer are “Double Threat” (Gracie pun). How has her influence improved you? She is my rock and my muse. Jennifer is what a truly strong person looks like. Without her I would be truly lost. Because of her I’m not only a better practitioner of the art of jiujitsu, I am also a better practitioner of Life. 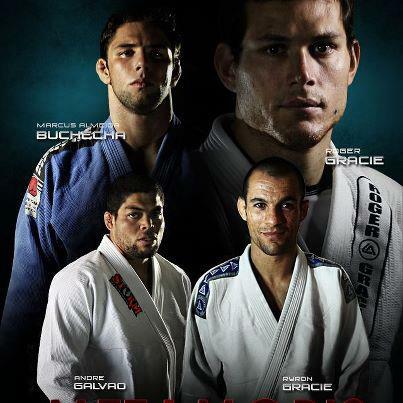 There has always been a lot of talk about gi jiujitsu and nogi jiujitsu. Whenever we see pictures of you, it’s always with a gi? What is your general feeling about the gi and its use? I love training with the Gi but I also love training without it. There are many aspects to this beautiful art so I try not to limit myself. Gi, No Gi, Gi with gloves, No Gi with gloves, weapons, Close quarters, flow rolling… the list goes on and on and all of these things are important to me. I also think it is important to train one day a week as if I am 70 years old in preparation for the day where my “young guy moves” are no longer efficient. In a purely self-defense situation, what (in your opinion) are your 3 most reliable techniques. How did you come to form Redline JiuJitsu and what was that experience like? In 2004 is when I officially started my Academy. I was pretty intense back then so the name redline comes from the tachometer on a race car. I feel very fortunate to have had the first Brazilian jiujitsu school here in Edmond, Oklahoma and still be around today. I used to be a sprinter but now I am more of a marathon runner when it comes to my philosophy of jiujitsu and even business. As an owner, business man and instructor of a Jiujitsu school, what is the most important lesson that you’ve learned? 95% of everyone who I have given free tuition to never valued the program and ultimately left the art. At the same time you cannot put a price on the ability to know how to keep someone from taking your life in the worst case scenario, so I do not charge people for jiujitsu, instead I charge them for the things that I need to live and to create the environment to transfer this priceless information. As the lead singer of a heavy metal band, how to do injuries, sore pipes (from chokes) and such affect your performance or the way you structure you days? Injuries typically do not affect me at all because I just don’t get injured that often. The reason for this is because I have no problem being tapped out by someone and I also have no problem taping fast (my defense is pretty good too). If jiujitsu didn’t exist, what other martial art might you have gravitated towards and why? What are Ty’s top 3 future goals; now or far in the future? Over the years my position/role/career as a martial arts instructor has offered many opportunities and experiences that I wouldn’t have had otherwise. The most recent of which took place last month, November 16th through the 20th, and took me back to California, a place I first had the pleasure of visiting two years ago when I participated in the Gracie Academy Instructor Certification Program in 2013. My second visit to California would also be connected to the [Gracie] Academy, only instead of Torrance, this time I would be going to Pleasanton, a suburb in the San Francisco Bay Area approximately 25 miles east of Oakland, CA. I decided to take advantage of a formal invitation to all CTC Certified Instructors to assist and participate in any upcoming Gracie Survival Tactics (GST) Instructor Certification Courses. Eager to get an inside look at this program only available to active or retired law enforcement and military personnel, and in desperate need of a vacation (even if it would be a working one) I jumped at the opportunity. I’m glad I did. It was an incredible opportunity to learn the GST curriculum first hand, meet some of my fellow CTC Instructors, and get some “mat time” with Ryron Gracie himself. For those of you who aren’t familiar with the program, Gracie Survival Tactics (GST) is the Gracie Academy’s Defensive Tactics Program for Military & Law Enforcement Personnel. Created by the Gracie Academy to meet the ever changing needs of their clients, the GST program is itself an amalgamation of two earlier combative/defensive tactics programs. Gracie Combatives, an intensive course based on the most effective techniques of Gracie Jiu-Jitsu developed for the United States Army, and G.R.A.P.P.L.E (Gracie Resisting Attack Procedures for Law Enforcement), a non-violent and court defensible program developed for police officers. Both of the aforementioned programs were originally developed by Rorion Gracie, eldest son of Gracie Jiu-jitsu founder Helio Gracie, and creative mind behind the UFC. Since it’s inception Gracie Survival Tactics (GST) has been taught to countless Federal, State and International military and law enforcement agencies including the FBI, the Secret Service and the US Border Patrol. During my five days assisting with the GST Instructor Certification Program I was able to meet men and women from a wide range of agencies and hear many of their first hand accounts of situations that they have found themselves in while on duty. As well as some of their concerns with the level of self-defense training that their agencies currently have in place. For law enforcement or military personnel (active or retired) wishing to learn Gracie Survival Tactics (GST) for their own continuing education, the complete 23 lesson course is available on www.GracieUniversity.com via online streaming video. However, if you are an officer wishing to implement the GST program at your department or agency the only way to do so is by completing the GST Instructor Certification (Level 1). The Gracie Academy teaches anywhere from 5 to 10 of these instructor certification courses a year varying by location. Some are hosted by the Academy itself at their main location in Torrance, CA while others are hosted by various agencies around the world or by individuals within those organizations. The particular course I volunteered to assist in was hosted by a member of the Pleasanton Police Department with the actual training sessions taking place in the gym of a local high school. The week long course began at 8am Monday morning and started with Ryron Gracie giving a brief history of Gracie Jiu-Jitsu, including its creation, their work with the US Army and the development of Gracie Combatives and how working with the military and law enforcement over the last 20 years led to the creation of the techniques that we would be learning over the next five days. He then moved seamlessly into the first of eight techniques that we would cover that day, setting the pace for the rest of the week. Ryron would teach a technique, using either myself or one of the other four instructors that were there to assist in the course, then when he was sure that everyone understood the technique he would release them to practice the technique with their partner. At this time the assistant instructors would walk around and observe the participants doing the techniques, offering feedback and making any necessary corrections. Day two and three began with the class reviewing all the techniques that they had learned the day before while. After the review period, which lasted anywhere from 10-15 minutes, we would move on the block of techniques that would be taught that day. The training sessions ended with a series of fight simulation drills in which the participants would combine several techniques from previous sessions with the ones that they had just learned, thus building their muscle memory and making them more familiar with how the individual techniques can be used in any possible combination. While the first three days were dedicated to the learning of the GST techniques, day four was dedicated to instructor training, where the participants learned the most effective ways to teach the GST techniques to their colleagues when they return to their individual agencies/departments. The fifth and final day of the course consisted of a final evaluation to test the participants overall comprehension of all the material covered during the previous four days. What sets Gracie Survival Tactics apart from other defense tactic programs currently being taught to law enforcement and military personnel is it’s lack of reliance on striking techniques (ie. punches and kicks) which may not be effective against an assailant who may be physically larger or stronger or who may be under the influence of a substance that dampens their ability to feel pain. Instead, all the techniques in the GST program are based on leverage, timing, and efficient use of energy. This means the techniques can be employed effectively regardless of gender, size or athletic ability. With the number of fatal police shootings reported to be nearing 400 nationwide in 2015, and allegations of excessive force at an all time high, GST provides law enforcement officers with a much needed alternative to relying solely on their firearm or secondary tools (ie. baton, stun gun, pepper spray) in situations where the use of deadly force could have possibly been avoided. The GST curriculum also address the high rate of instance where law enforcement officers are shot in the line of duty by an assailant using the officer’s own firearm by including weapon retention techniques in the curriculum as well as a variety of effective techniques that allow an officer to get back to their feet and create distance in the event that they end up on the ground underneath an assailant. With a seemingly endless list of benefits and advantages, it’s hard to imagine that all law enforcement agencies aren’t already taking part in the Gracie Survival Tactics program. From conversations I had with some of the men and women participating in the GST Level 1 Instructor Certification Course, I learned that one obstacle the newly certified instructors will encounter when trying to implement the program in their own department may be the very officers that they are trying to help. Whether it stems from an over reliance on the tools they have at their disposal or the lack of continued fitness requirements after they graduate from the academy, some officers seem resistant to any self-defense training outside what is mandated annually by their state. When you consider that 40% of officers that are shot in the line of duty are done so with their own weapon, it would seem that all law enforcement officers would be eager to learn any technique that, would not only teach them how to retain their weapon, but also how to subdue a suspect without the use of their firearm or auxiliary weapons. Another obstacle that new GST Instructors may have to deal with is a natural resistance to change. Either from the administration or from their department’s defensive tactics instructor, in the event that the GST Instructor doesn’t also serve that role. Strategies on how to address these and other common concerns are included in the support materials that each course participant receives on the final day of training. Gracie Survival Tactics is quickly proving itself to be not only a valuable resource for law enforcement officers, but to military personnel as well. As I am writing this article, the United Nations Security Service has become the most recent agency to adopt Gracie Survival Tactics. My experience at the GST Level 1 Instructor Certification Course in Pleasanton, CA was like nothing I have experienced before and I am extremely grateful to have had the opportunity to not only assist, but to participate in the training as well. As a martial arts instructor I’ve had the opportunity to teach students of all ages how to defend themselves. Even if learning self-defense was not their primary reason for enrolling, it was still a skill they acquired while working towards whatever their personal goals were. Having said that, I have to admit that there was something exceedly rewarding about working with individuals that will most likely be using the techniques you are teaching them a regular basis. I (Michael Joyce, CombativeCorner Founder) came across Sally when researching jiu-jitsu uniforms and rashguards. There were 3 things that caught my eye: (1) She’s a passionate practitioner of jiu-jitsu and it showed in her writings. (2) She doesn’t hype herself up and honestly strives for improvement on and off the mat and (3) she’s the same size and stature of my wife, Jennifer. It’s always exciting and empowering to see dynamos in action. After catching up with her on Facebook, she agreed to give us an interview – and we’re overjoyed and honored to add her to our Combative Corner family. What brought you into jiu-jitsu? There were a lot of different things happening leading up to my trying jiu jitsu. I used to get up every morning at around six to lift weights and it was never much fun. Then my training buddy moved away and it became more of a chore than anything. I used to read some of Tucker Max’s stories on Rudius Media and a couple of the blogs he hosted covered weight lifting and Mixed Martial Arts (a few of those writers cover MMA and for Bloody Elbow now including Ben Thapa and Tim Burke). There was also a blog called The Bunny Blog by Erin Tyler. She had been getting into Muay Thai and wrote about how satisfying her training was so I began developing an interest in martial arts. Around that time I was robbed at gun point a couple of times and felt pretty vulnerable so everything kind of came together. I tried Muay Thai first but quickly switched to BJJ. Where I’m so small, it made sense to learn a martial art that a small person developed to defeat a larger person using leverage and strategy rather than strength. How does jiu-jitsu add to your life off the mat? Jiu-Jitsu has gotten me into the best shape of my life. I’m much healthier now at 38 than I ever was at 28 or even 18. I also met my boyfriend at jiu-jitsu, but aside from him, I find that spending my free time among people who work so hard to improve themselves has motivated me to consistently improve my life in every way. If you had to name them right now, what would be your 3 favorite submissions? My three favorite submissions are the triangle from guard (vide0), the belly-down arm bar (video) and the arm triangle (video). You’re also a writer for Breaking Muscle. How did you get that gig and what is your role there? Initially I was a guest contributor but eventually I was kept on as a weekly contributor. That’s actually another thing I learned from Tucker Max. In his article, “How to: Find a Mentor (and Succeed Even if You Don’t), he said, “To earn a position, start by giving lots of work away for free: If there is a person you specifically want to work for, learn about them, figure out where they need help, do it, then give it to them. FOR FREE.” I feel very fortunate to be a part of the Breaking Muscle team and considering how many talented writers and athletes are out there, I’m still kind of surprised they chose me! One of the articles that I eventually wrote for Breaking Muscle talked about life lessons I had learned. One of them came from talk show host Kelly Ripa. On their show one morning she was telling Regis that she was going to be on the cover of a magazine. Regis teased her, saying wasn’t she special? Kelly’s response was “Why not me?” Why shouldn’t she be on the cover of a magazine? I never actually thought they would say yes when I asked to be a contributor at Breaking Muscle but I remind myself of Kelly’s words in those situations. Now I always ask for what I want even if it’s likely I’ll be rejected. You never know who will say yes! Enthusiasm goes a long way. What do you like and dislike (if anything) about competing in jiu-jitsu/grappling tournaments? What I really like about competing is that it’s the ultimate reality check. No one is going to go easy on you at a tournament and if you have a skilled opponent, they will help to identify the weak areas of your game. Training with the same people all of the time, you get into a lot of the same battles over and over again, so it’s a great way to get a fresh perspective. I’m not a huge fan of competing but I would like to go and compete in New York or Boston at some point. I expect that there would be more women in my division at those tournaments. Do you supplement your jiu-jitsu training with anything? If so, what might that be? Yes, I supplement my BJJ training with strength training and cardio. My training outside of BJJ varies but I basically read Joel Jamieson and William Wayland’s work and do what they say. Joel Jamieson has coached UFC Champions like Rich Franklin and Demetrius Johnson. He actually wrote a book called Ultimate MMA Conditioning and just came out with the Conditioning Blueprint DVD that helps athletes understand energy systems and build a training plan tailored to their performance needs. I also use Jamieson’s BioForce HRV system to evaluate my fitness level and monitor recovery to prevent over-training. William Wayland is based int he UK and has helped guys like UFC fighter Luke Barnatt to develop knock out power in their hands, in addition to overall strength and conditioning. He’s the author of Powering-Through and contributes regularly to Scramble’s blog. What is your message to women in regards to studying the martial arts (or jiu-jitsu in particular)? My message to women is to be authentic. If you want to learn jiu-jitsu, learn jiu-jitsu. Remember why you are there. Be a good student and the rest will follow. BJJ classes are usually made up of 90% men and 10% women, if you’re lucky. There is so much content available online about women and jiu-jitsu, I would recommend they carefully consider what they buy into. I feel the most self-aware and well-articulated insight and advice regarding women (and men) training in jiu-jitsu has been contributed by Valerie Worthington on Breaking Muscle. Are you a fan of the mixed martial arts? Why or why not? I love mixed martial arts. I’ve always been impressed with the innovation and heart shown by the athletes. The UFC is coming to Halifax in October and I can’t wait! What are your short-term martial art goals? What are some of your favorite things to do outside of the gym/dojo/mat? I actually don’t have a lot of free time. I work full time, I write my articles for Breaking Muscle and Jiu Jitsu Style if I have something lined up, I train and teach a few times a week and on weekends I go to visit my boyfriend and train at his club. I’m also resuming Certified General Accountant certification classes very soon. It’s hard to find the time to do much else. I like to shop online if that counts. If you were an anime character, what special power would Sally have? I don’t know a lot about anime but I think if I had a special power it would be to make myself twice as heavy as a I look so I could squish people at BJJ. I’d like to give a shout-out to my sponsors, if you don’t mind. Thank you Jesse Bellevance at Killer Bee Kimonos for the amazing custom gis! You can save 15% on any custom gi with code CUSTOM15. People can also save 10% with code FACEBOOK10 on all other Killer Bee products. Bill Thomas at Q5 Combat supplements has also been so supportive, keeping me healthy with their amazing products. The ones I use the most are the Amass Whey Protein, Krill Oil, Joint Armour, Warrior Green, BP8 Stinger and Vitamin D3. Shipping is free in the US and you can save 10% with code SALLY10. Finally I’d like to thank Martin Blaise of Aggro Photography for the amazing photos he’s provided me with. Thank you very much, Michael! I wish you and your readers all the best! A while back I was sparring with Rener and I remember being in danger of a choke. His attack was relentless. I tried every technique that I knew, but the choke kept getting deeper and deeper. Seeing no other option, I abandoned the idea of pure technique and used everything I had to twist free from the choke. Let me be clear… I was more than close to losing the battle. What kept me from tapping or sleeping was not technique, but a strategic explosion. Q: Is it better to be technical and lose or explosive and survive? Its more efficient and a better investment of your time to be technical and lose. There is value in exploding out of bad situation to safety, it helps you understand what you are physically capable of. Be aware of the risk of injury , worsening the position and most of all running away from learning the intricacies of jiu-jitsu. The fact is: There are different types of jiu-jitsu being played. Players of jiu-jitsu have different motivations for taking up the martial art… And there are also different approaches to the art. When jiu-jitsu becomes a spectator sport, is there or should there be one kind? Some say yes. I certainly say, no. Watching Ryron (in the match above) reminded me of boxer Pernell “Sweet Pea” Whitaker in his prime. Whitaker was a masterful, defensive boxer that many fans disliked watching. Those that knew boxing saw genius and couldn’t look away. There is an obvious genius in Ryron’s game, mixing outstanding defensive maneuvering and thoughtful attack. After the allotted time was over, Andre spoke with commentator Rener Gracie and spoke his mind. Many were disappointed over his lack of humility, and although I didn’t care for it, I found it understandable. Andre is a person whose drive is competition and he was up against someone whose drive is to “Keep it Playful.” Even though Ryron had it in him to win (submission only), his nature, training and goal was to show HIS jiu-jitsu – that is to say, his family’s jiu-jitsu. Andre said (wanting to set up a rematch), “…I could set up a fight on my rules and see who wins.” And although “the rules” are unclear, the fact remains that a submission was never achieved (which reminds me of the famous Helio quote, “If you don’t lose, you win.”). But my personal thought is this, “Everyone has their arena.” Those that want tournament style can join or watch the tournaments. Those who want to test their might in the arena of fighting can join the UFC. But if you want to test your jiu-jitsu – the way YOU play jiu-jitsu – this event was such a platform and I am looking forward to watching more. Also, let us know who you’d like us to interview in the future, and what questions you have for him or her. For our Master List, go here. For more from The CombativeCorner, click the links below. Like many martial artists before me, Brandon and I came to jiu-jitsu by way of the ‘Shark Tank.’ Growing up in the martial arts that were available to us, we learned how to protect ourselves standing up. For years, in our minds, that’s all that existed in our world, and in our training. Obviously, when the Gracies came around and the UFC started, we got our glimpse ‘behind the mountain.’ When we finally got to roll with someone with jiujitsu experience, we found ourselves struggling to stay afloat. Life takes people in different paths. Brandon came by way of Karate. I came by way of Taijiquan. Where the road would lead (for us) would be at ‘Jiu-Jitsu Junction.’ This double-lane road is paved with excitement and we proud and eager to explore this journey with you. Together, we will explore the lessons, the pitfalls, the mindset (and more) of the student on the quest to blue belt. And like every journey, the writings herein are not solely for the beginner. we encourage you to comment, add, and/or reminisce with these posts.